This is the most detailed map of El Yunque National Rain Forest that you will find. 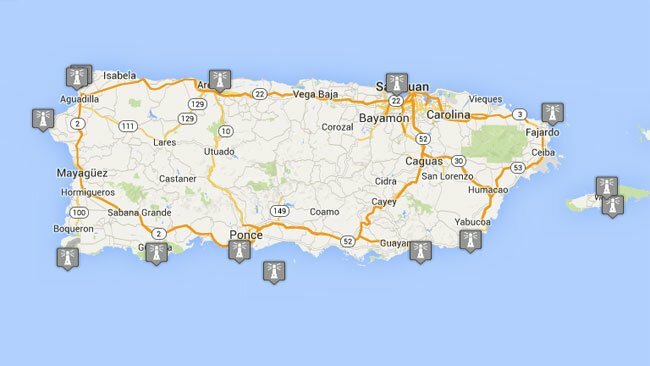 The Lighthouses of Puerto Rico! 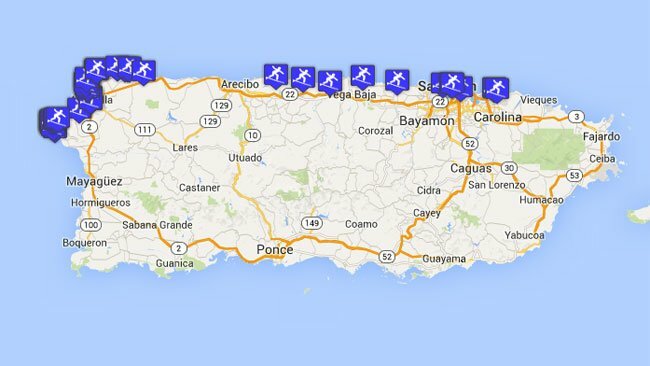 Surf Spots of Puerto Rico mapped out for you! Part way up the road in El Yunque National Forest you will come across a busy parking lot on the left side of the road. The sign by the parking lot will read, Big Tree Trailhead La Mina Falls. This is the first of two access points to the ultra popular La Mina Waterfall. The second entrance to La Mina Waterfall is further up the road at Palo Colorado Information Center & Picnic Area, which has multiple trailheads. On the far southwest tip of Puerto Rico you will find the Cabo Rojo Lighthouse, or El Faro Los Morrillos, standing on a scenic cliff. It began service on August 20th, 1882 and still runs today. The location is quite popular and the scenery is outstanding! You can visit the exterior of the lighthouse any day, but the interior is only open Wednesday through Sunday. Cueva Ventana, also known as the Window Cave is a MUST DO for anyone looking to explore Puerto Rico. It offers up a once in a lifetime experience. Our biggest recommendation is to pick a nice sunny day. We are going to update our photos because as you can see, we chose a overcast day. The road leading up to Cueva Ventana is an easy drive and parking is allowed at the gas station. We have heard that they started charging for parking. While visiting El Yunque National Forest you should be sure to visit the Palo Colorado Recreation Area. This area is home to more things to do than any other area in El Yunque. Palo Colorado acts as the hub to multiple trailheads, picnic areas, restrooms, lots of parking, a visitor center with guided tours available, rivers, waterfalls, and historic pools. Check out our map below for a detailed GPS location of the Palo Colorado Recreation Area. 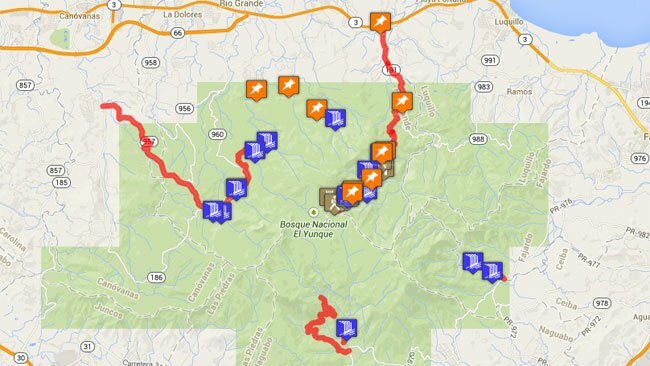 In addition to the Recreation Area we have the trailheads, parking, and other points of interest marked. In addition to the map we have pictures that should give you a good idea of the Palo Colorado Recreation Area layout. La Mina Trail is one of two hiking trails that lead to the extremely popular La Mina Waterfall of El Yunque National Forest, the other one is Big Tree Trail. However, La Mina Trail starts out in an area that provides many other things to do compared to that of Big Tree’s Trailhead. The Trailhead to La Mina Trail is located at the Palo Colorado Recreation Area, which is the hub to multiple hiking trails, the visitor center, rivers, and picnic areas. One of the other benefits to this location is the amount of parking available. There are multiple lots, with parking on both the south and the north side of the Palo Colorado Visitor Center.